Held at Wembley Stadium, Smaart Skills was a careers event aimed at young people (mostly Years 11, 12 & 13) as yet undecided on their next steps/career. Our research had shown that most of this audience wasn’t familiar with Whitbread, but knew some of Whitbread’s brands – Premier Inn, Beefeater, Brewers Fayre, Table Table, Taybarns & Costa. Whitbread wanted to raise the employer brand awareness of their apprenticeship scheme and wider training and job opportunities across their brands. The main employer proposition was that Whitbread has a vast amount of training and career paths on offer and by joining the UK’s leading hospitality company, you’ll be embarking on a long-term career journey that could take you in a number of directions. Our brief was to create a concept that would both appeal to young people but that could also be used for other internal and external recruitment purposes. We also needed to ensure that Whitbread made an impact and that candidates had a memorable, fun taster of what it would be like to join Whitbread. 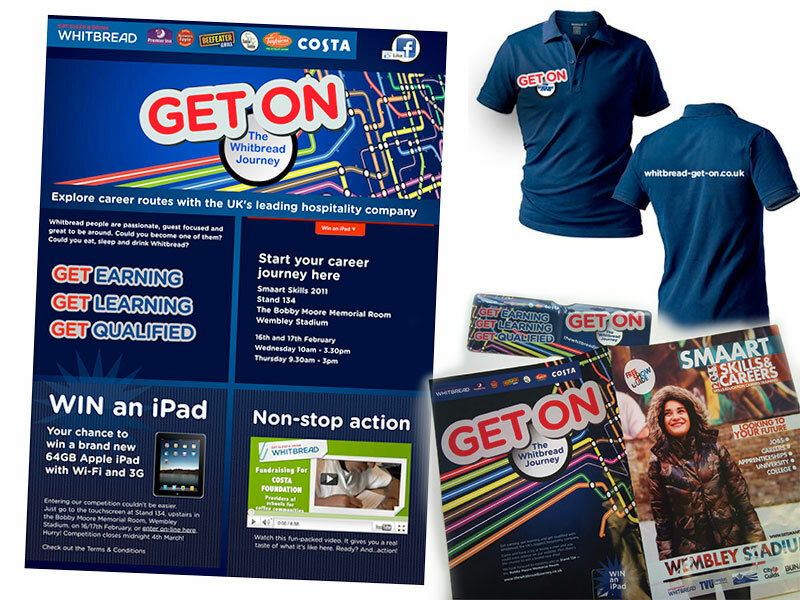 WDAD came up with a new concept “Get on the Whitbread Journey” with a striking design that ran across all materials including exhibition stand, event guide, giveaways, Facebook and dedicated microsite. To attract as many students as possible and capture their data, students were asked to answer a question about Whitbread’s management training scheme for the chance to win an iPad. They could enter via an interactive kiosk, SMS texting, Facebook or the microsite. An activity area was set up on the stand with teams of students being tasked with whipping up an Eton Mess. Competitions were filmed and footage posted on the microsite.